I was a sinner. Of that there was little doubt. Not only did I know I was, but I had been told I was for as long as I could remember. When I was a sophomore at Woodstock, E. Stanley Jones came to speak. He was a Methodist missionary, internationally known as an evangelist and an effective one. The “Ashram Movement” was, in essence, his idea. Taking a traditional, culturally appropriate Indian tradition of a spiritual retreat he, along with some others, re-cast it in a Christian context. It should have been wildly successful, but it was only modestly so. I think the idea was never adopted by evangelicals because it was perceived to have had “liberal” origins. It was a shame because the idea was and is excellent. His fame preceded him and when we came to chapel that morning we saw an older, seemingly frail, gray haired man ascend the platform. Our principal, Canon S.R. Burgoyne (or just Mr. Burgoyne most of the time) introduced him. We learned that he first came to India as a young man in 1907 sixty years earlier and that his book, “The Christ of the Indian Road” published in 1925 sold more than a million copies. He was a personal friend of Mahatma Gandhi (in fact, this biography on Gandhi was read by a young black preacher named Martin Luther King, which influenced his non-violent protests for equality in the south). E. Stanley Jones got right with it. He was an evangelist, this was an audience and surely there were a few sinners out there. I know because I was one of them. His message was clear and passionate. At the close of his time he gave an altar call, asking if anyone wanted to come to the Savior– to become born again, to accept Jesus into his heart–to come forward. There was no pianist playing “Just As I Am”, but that might have helped because no one came forward. Not one. So he gave a second very persuasive and passionate plea. Still no one came forward. So he widened it a bit (as evangelists are want to do) to anyone who would like to re-commit his or her life to Jesus. It was getting embarrassing. One of the most noted evangelists in the world at that time could not get a rise out of these students. Finally, on his third try, Mary Ellen Redding and Ruthie Warren got up and went forward to recommit their lives to Christ. But those of us who knew them (and we knew them well because they were friends and in the same mission) knew they were the least likely pair in that whole place that needed to recommit their lives at that point. Myself? I lived a life of sin. We knew all about sin. This included (but was not limited to) a thorough understanding of the fall, the Adamic nature (also known as the Old Sin Nature), as well as the feeling that simply being a boy provided a proclivity for sin (which may well have been true). It seemed to us that the adults in our lives made no distinction between being a “nut-cut” (mischievous) and total depravity. We grew up in a time and place of true missionary commitment. My parents and their peers fully expected to die with their boots on out there. Meanwhile, they wore pith helmets, armed themselves with a wide variety of practical skills and did not shy away from doing spiritual battle on the front lines. They were willing to leave family and friends for five or six years at a time and sometimes longer, at which point they would return to their country of origin for a year of “furlough”. And then return back to the field. They came to a land with a frightening array of deadly and debilitating diseases, cultural differences and an exasperating language with such things as aspirations where a little more breath on a consonant changed the meaning of a word. They are, in my book, heroes of the faith in spite of their own sundry problems with sin (and I could write a book on that too). And on lazy days when there was little to do and even less on my mind I would find a comfortable, grassy spot and lie in the sun and stare into the sky. And my thoughts would almost always find their way to a subject that intrigued and at the same time frightened me witless. Eternity. The concept of living forever, for ever. And ever. And EVER. No end. I always ended up dizzy. I did not like the concept but I could not NOT think about it. Sin is a small word with big consequences. It provided the impetus for missionaries to go—countless millions were lost, going into eternity without hope, without life, without knowledge of the cross, without pardon for sin and a peace that endureth. We sure as there is a hell knew what sin was—both sin of commission and omission. It was pretty much in crystal focus. And that focus on sin clouded, unfortunately, a Biblical counterpoint, a focus on grace. For me, that would come in time. It never came for some of my friends. Grace, I would discover, was a sumo wrestler among pygmies, a Pitbull among Chihuahuas, a trump that trumps trump. It seems that in the environment where we were things tended to go one of two ways. We eventually realized the faith of our fathers is living and powerful and can be had under the most generous of terms. Or else the message got thoroughly clouded by the constant repetition and overemphasis of sin and its damnable consequence, perceived and real, hypocrisy, and a host of other factors. I doubt a single one of us left Woodstock without knowing the plan of salvation, something about the life of Jesus, as well as the story of Abraham and origin of the Jews and other stories from Old Testament. Knowledge we all had. As I started to mature I realized just how much of a constant sinner I really was and the fact that it was at least partially enjoyable…when you could get away with it. Fortunately my parents were not aware of everything we did, so we got away with quite a bit. As long as we tried our best not to embarrass them and as long as what we did was not illegal or outright immoral we could pretty much sin in peace. It also became pretty clear that faith had a fault line. The fault was, it seemed, Jesus. The name of Jesus was a kind of shibboleth. The conservative (read evangelical) missionaries would use the name of Jesus freely. They prayed in Jesus name. Jesus was a friend. He was in their heart. And then there was the other group who did not mind talking about God, but lordy lordy, Jesus was not much evidenced in their vocabulary, except when necessary. Yes, they did believe in an historical Jesus, but they did not use terms like ”born again”, although I would like to believe most of them were. The former were focused on bringing more sheep into the fold. The latter seemed most happy to deal with the needs of the sheep already in the fold, or to serve the sheep outside the fold in a variety of very constructive ways with no clear intention of seeing if they would be willing to come into the fold. Life went on. We had church on Sundays, which almost always included Sunday School. During the winter months we often listened to sermons on tapes (reel-to-reel in those days) sent by one of Dad’s classmates from his seminary days. We had chapel at school, once a week. And on Sunday afternoons each week we had Bible Club, which met at 3 PM at Bothwell Bank. Dad led this and we had a steady stream of guest speakers. Most of the time he gave the lesson. Or tried to. One Sunday Gordy and Tim Larson held up a hand written sign from the front row where they were seated which said, “Your zip is down.” Dad casually placed his clipboard with his notes strategically in front of his trousers and kept talking. He soon found a way to swivel around and in one fluid motion reached down to pull his zipper up. It was not down. Gordy and Tim were shaking with silent laughter by this point and fortunately Dad thought it was funny too. He simply leaned over and said, “I’ll deal with you later.” But he never did. 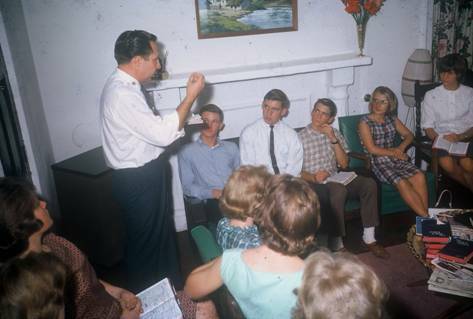 Bible Club was held every Sunday afternoon at Bothwell Bank. Seated (left to right): Gordy, Ken Waldock and Tim Larson, Gwynie Lewis just to Tim’s left, and then Tempee Shelly. Then along came George Verwer. George was young (only 11 years older than I was when I first met him in 1966) and the founder and leader of OM—Operation Mobilization. He was a radical and we had never seen one before. He was also dynamic and outspoken and was out to set the world on fire and had matches in one hand and gasoline in the other. He had been in prison in Russia, and he was shortly to become persona non grata in India. He was a nutcase. Different. Radical. We heard him preach at Kellogg Church. And teach at Bible Club. Sometimes he ranted. And yet, somehow, he appealed to me. And so did his message—which is the same message I had heard all my life with a double dollop of emphasis on grace. We struck up a friendship. Everyone has his own story. And there is never just warp or just woof in the fabric of life and there are many people who impacted me. Just very few that did so like he did. I went on to college. George wrote. And when he came to Seattle he would let me know and I would meet him. Or drive him around. Or help find a location to hold a meeting. Or sell books for him at a meeting where he was the main speaker. Later, when I was in Seminary in Dallas, same thing. Shortly after finishing college I joined the Wycliffe Bible Translators and eventually when we got to the tribe where we worked, in the far reaches of Southern Sudan, about twice a year I would get a personal note from George. And when he got his cell phone, and we were back in Dallas, I would get calls from a variety of places all over the world: “Steve, just wanted to give you a quick call to let you know I am praying for your daughter Cammie. We’re here in Budapest for meetings (or Hong Kong, Sri Lanka or someplace in Scotland or wherever).” Cammie had cancer and in addition to all his cares and concerns in managing 3500 missionaries in 80 countries (at that time, but many more than that now) he wanted to let us know he cared and was praying. I have just completed my tenth year as a board member of Operation Mobilization here in the US. It is a privilege I savor for the Savior. We lived among giants of the faith—our parents, their peers, other missionaries and a host of national Christians. Too bad I didn’t realize it at the time. 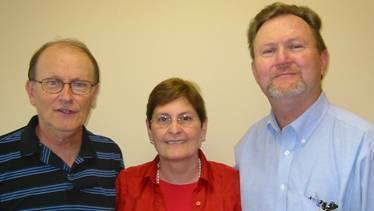 George Verwer, his wife Drena, and me (2004). Now, if you have never done this before, find a pleasant spot outside on a nice day and see if pondering your navel will make you dizzy. No? Now try eternity—forever and ever. And ever. And EVER. Without terminus.